It must be the toughest of decisions for an artist to temporarily banish the blanketed confines of a band operation to strike out alone. With this in mind, the time and opportunity has arrived for Pete Gow to momentarily sideline Case Hardin and progress down the solo route. Whether HERE THERE’S NO SIRENS becomes a debut or remains a one-off is for the future, but the present is set to look fondly on a singer-songwriter soundly adept at plunging into a deep narrative. The eight songs that form the rump of this record collectively roll out as the latest release on the Clubhouse label, a stable rich in many fine acts over recent years including Case Hardin. Starting with its architect illustrated on the cover in a pensive and contemplative pose, the scene is set for the songs to filter out from a production process that enriches the mood of the core compositions. However you approach this record, the touches of finesse from Joe Bennett in his production steering capacity bubble away at the surface. Ranging from a continual stringed presence to delicate enhancements such as snippets of brass made to songs likely born out of just an acoustic guitar. ‘Strip for Me’ is arguably the track to bounce around the ears first upon initial listens, predominately from a song writer’s move to plant the name ‘Stormy Daniels’ at the heart of the chorus. Wherever Gow intends that song to go, visions of presidential impeachment amongst other things fills the mind of the curious. Earlier in the record, opening track ‘One Last-One Night Stand’ acts as a lightning rod of what to expect. That is Gow searching deep to communicate with the themes, characters and issues inspiring his writing. 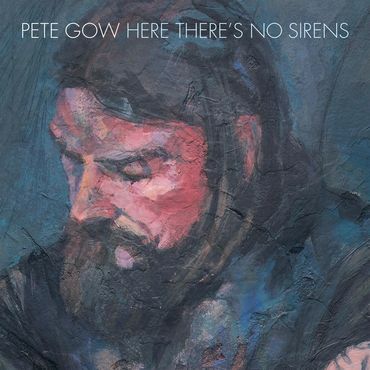 This is a diversion from rock ‘n’ roll into the kingdom of the serial low-key singer-songwriter and Gow spares little time in settling into a deep-rooted mellow groove to find the right mode to get across the message. Each of the eight tracks operates in their own therapeutic space allowing a mutual feeling to swallow the message or tap into the precious vibes emanating. There are even moments across the forty-minute playing time when you feel you are leaving the world of a Londoner and moving in the transient circles of a mid-west troubadour. Well, we do have a tendency to call this Americana in 2019. Ultimately, it is a lavish canvas allowing Gow’s sincere songwriting to flourish that moves this album into pole position. Soul searching, recurring themes and an artist metaphorically bearing all collectively prospers in the grooves of HERE THERE’S NO SIRENS. Pete Gow has wasted not a breath of this Case Hardin detour and delivered an album inviting some serious listening, whilst finding willing ears.